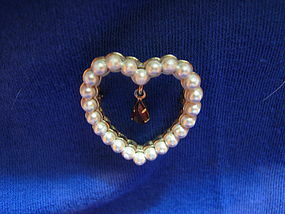 Faux ruby and pearl brooch (the faux ruby looks more like a garnet). There is no damage. I need your zip code to calculate the postage. 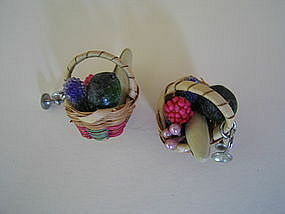 Vintage wicker basket and fruit earrings. 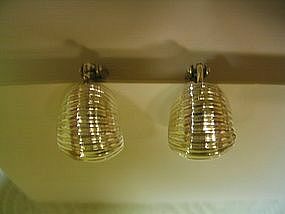 They measures approximately 1 1/4 x 1 1/4 inches. There is no manufacturing information, but probably were made in Japan. They are screw-on style. Both earrings are missing the little stone on the front of the screw on ear pieces. I have complete condition photos available by email. I need your zip code to calculate the postage. Earrings marked as Alpaca Mexico. They measure approximately 2 inches in length. Additional photos by email. I need your zip code to calculate the postage. 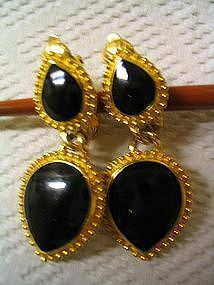 Earrings marked Avon. There is no sign of use or wear to these earrings. I need your zip code to calculate the postage. 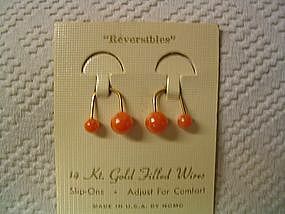 These earrings are not new but from the late 1990's. Sterling silver 925 and are not those flimsy little things that feel like starched tinfoil, but have a bit of weight. They measure 3/4 inches. I try to photograph all jewelry in the outdoors, because I find it gives a true image, but unfortunately, sometimes it will cause reflection, which in this case it did. There is no damage to the earrings. Additional photos or info by email. I need your zip code to calculate the postage. 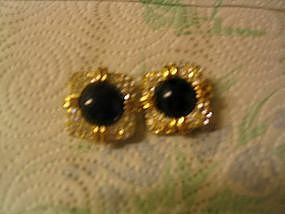 Soft clip earrings measuring 1 1/2 x 1 1/4 inches. Never worn. Additional photos or info by email. I need your zip code to calculate the postage. 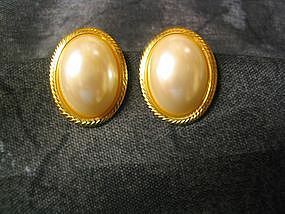 Goldtone faux pearl earrings with Napier's wonderful adjustable screw backs. The are 3/4" in height and 1/2" in width. There is no damage to the earrings. I will be happy to provide additional photos. I need your zip code to calculate the postage. 14 Kt. gold filled wires. They are called slip ons. Original card with a Woolworths price sticker on the back. (Golly, I would love to sit at a Woolworths lunch counter one more time). No damage. I will be happy to provide additional photos upon request. I need your zip code to calculate the postage. 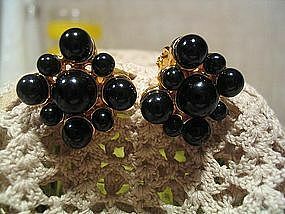 Clip on faux onyx earrings measuring 1 1/4 inches in length. Marked Trifari in two places. No damage - the white spot in photo is glare. Please email for additional photos or info. I need your zip code to calculate the postage. 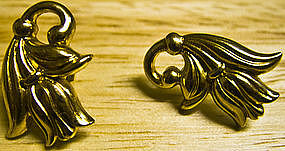 Goldtone doorknocker earrings for pierced ears. They measure approximately 2 inches in length and 7/8 inch in width. No damage, but probably need to be cleaned since they have been loose in my jewelry box. I will be happy to provide additional photos. I need your zip code to calculate the postage. 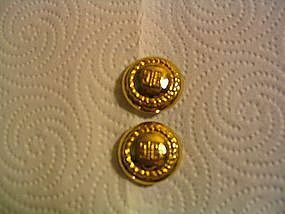 7/8" goldtone Napier earrings. The beads are set to form a triangle. Screw backs with a spring hinge which makes them most comfortable. No damage. I will be happy to provide additional photos or answer any questions regarding their condition. I need your zip code to calculate the postage. 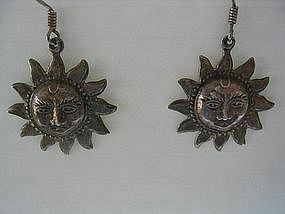 These silver toned earrings have a clip on which is equipped with a screw on mechanism to give more comfort to the ear. They 3/4 inch in height and 1/2 inch in width. Additional photos by email. I need your zip code to calculate the postage. 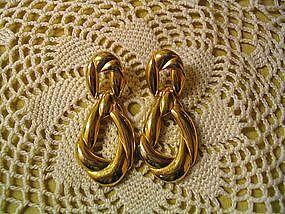 Goldtone soft clip on earrings and measuring 3/4 inches. There are no problems with the finish and clip securely. 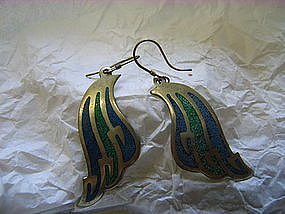 If you have any questions regarding these earrings or would like additional photos, please email. I need your zip code to calculate the postage. Faux onyx surrounded by crystals. 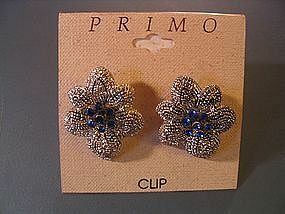 They measure approximately 1" across and are soft clip-on. There are no missing stones or loss of finish. I am sorry the pictures just don't do justice to the earrings. I need your zip code to calculate the postage.